^ "Shareholding structure | EDF France". Edf.fr. 2016-12-31. Retrieved 2017-03-30. 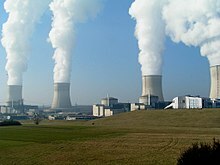 ^ "France could close a third of its nuclear reactors, says minister". 2017-07-10. Retrieved 2017-07-13. ^ Nastu, Paul (2008-10-13). "French President Gives EVs, Hybrids Green Light". Environmental Leader. Retrieved 2017-03-30.